George Tziallas holds a Diploma in Civil Engineering (University of Patras, Greece) and a Master's Degree (M.Sc.) in Urban and Regional Planning from the University of Tennessee at Knoxville, USA. He has a twenty-five year professional experience in management consulting, specializing in the fields of local and regional development, tourism development and planning, as well as in the management and evaluation of EU Programmes and projects in Greece and abroad. George has recently been elected as Vice-Chair of the OECD Tourism Committee. 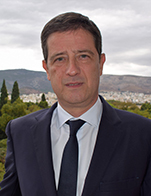 He has worked in senior positions in management consulting firms for more than twenty years, and served as a Member of the Board of Directors of the Hellenic Association of Management Consulting Firms (SESMA). He has been the project manager of large-scale technical assistance projects at national and EU level and has excellent knowledge of the Greek public administration procedures, as well as of the EU Structural Funds context. © Copyright 2018 Capital Link Inc. All rights reserved.